NSW Health has delivered a standardised in-hospital emergency number across 132 of its hospitals, making care even safer for the millions of patients it treats every year. Led by eHealth NSW in partnership with the Clinical Excellence Commission and the Agency for Clinical Innovation, the project to standardise the in-hospital emergency number as ‘2222’ will support clinicians who work in different hospitals across multiple Local Health Districts (LHDs) and who may find it difficult to recall each facility’s emergency number. Ninety-six hospitals, primarily small rural sites which do not have a dedicated internal emergency response team, will continue to use 000 as their in-hospital emergency number as per current process. 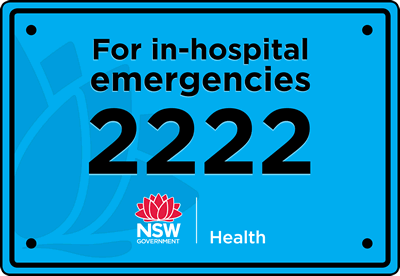 Dr Amith Shetty, Staff Specialist at Westmead Hospital, welcomed the move to standardise as 2222 the in-hospital emergency number, of which there were previously many variations, for most NSW Health facilities. “Having a common number of 2222 means I can now rest assured that no matter where and when I face a clinical emergency, I get the right response without needing to recall the local in-hospital emergency number,” Dr Shetty said. To ensure a successful implementation, teams were assembled at each LHD or Specialty Health Network, with each team defining an appropriate approach to deliver the change locally and communicate with frontline staff. The steering committee, chaired by Dr Harvey Lander, Director of Systems Improvement at the Clinical Excellence Commission, provided oversight and coordination and advice on planning, governance and communication. The Agency for Clinical Innovation provided guidance for communicating with the clinical community, and the Health Emergency Management Unit (HEMU) was also consulted for its expert knowledge on emergency disaster management. “This is a great example of a system-wide change being achieved with collaboration, trust and a common goal of improving patient outcomes,” said Ian Schrader, Director of eHealth NSW’s Infrastructure Portfolio.